This pavilion within a traditional Walled Garden, our contribution to the Festival was a completely 'over the top' exercise in Post Modernism. The project architect was Keith Cunningham, who went on to do further work for Burrell, most notably Caledon House in Edinburgh 2002. It was from here that Andy Burrell and John Forbes started their collaboration, Forbes leaving Groves Raines in 1988. 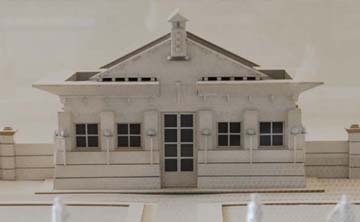 The model, illustrated, was one of a number of excellent models created by the late Andy Baxter. It hangs on the wall in the Burrell offices to this day.